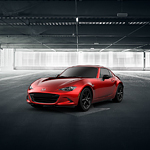 Boasting classic design and style makes the Mazda Miata popular as a hardtop convertible sports coupe. The new upgraded engine ensures that the MX-5 Miata RF performs better than ever. Feel the difference for yourself by taking a test drive at your local Mazda dealership, like Piazza Mazda of Reading. The Mazda MX-5 Miata Rf comes with a 2.0-liter, four-cylinder engine that easily delivers up to 181 horsepower. The upgrade increased the rpm rate from 7,000 to 7,500. The engine has lighter pistons and connecting rods combined with a larger throttle opening. The fuel injection system is electronically powered. The overhead cams are chain-driven. The exhaust system has also improved. Future MX-5 owners also have the option of choosing between the six-speed manual or the six-speed automatic transmission. Regardless of the color, style and technological options you prefer in the MX-5 Miata RF, they are all created to perform. Explore the options at our Mazda sales location.